Reproductive rights advocates aren’t taking this proposal sitting down. Fourteen Democratic governors have vowed to take legal action if the Trump administration makes good on its promise to deny women access to the health care provided by these clinics, which includes STI testing, cancer screenings, and affordable contraception. But government officials aren’t the only people fighting the domestic gag rule. The sexual health advocacy nonprofit Advocates For Youth, as well as its volunteers, are on the front lines during the 60 day public comment period that could potentially alter or halt the administration’s proposal. "[By] taking away funding from Planned Parenthood centers and any health care center that performs abortion care or provides referrals, it specifically impacts low income people and people of color because they're predominantly the recipients of Title X health care," Manes told HelloGiggles. "It also really changes the patient-provider relationship. If they receive Title X funding, providers are no longer obligated to give someone their full reproductive options. That's wildly concerning because in many ways it's coercive. It's hiding critical info from people about their own health." The domestic gag rule has not yet gone into effect and, during the 60 day public comment period, Manes encourages anyone who cares about reproductive rights to make their voices heard. She says now more than ever is the time to be vocal about the danger of this rule. And, although everyone should raise their voices right now, it’s important to remember that this specifically affects young people — which is why Advocates For Youth is so committed to ensuring the domestic gag rule doesn’t go into effect. "I want to emphasize how this impacts young people. Any proposed rule that goes into place regarding reproductive health care always has more severe impact on young people because socially they have less access to information and fewer social advocates," Manes said. "And if young people are going to their providers and are not getting the full information about their reproductive options at home, that’s gonna drastically change what the reality looks like." 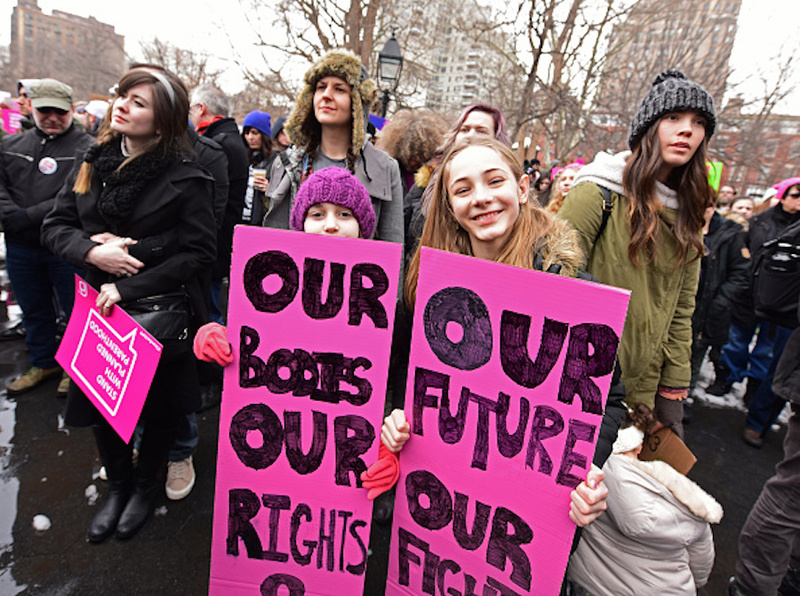 Diana Thu-Rhodes, Director of Policy at Advocates for Youth, told HelloGiggles that she’s not surprised young people have quickly mobilized in light of the proposed domestic gag rule. Throughout her career, Thu-Rhodes said she’s witnessed firsthand that young people have always been on the frontlines of social justice movements for bodily autonomy and liberation — and this became even more clear after the 2016 election. "For many decisions this administration is making, whether it’s LGBTQ health and rights, sexual and reproductive health, or immigration policy, young people are on the forefront of these movements," Thu-Rhodes told HelloGiggles. "I think what we’ve seen with the gun violence movement proves that young people will continue to fight back and they aren’t in the dark." Thu-Rhodes also emphasized the importance of working within our own communities and on the state and local level — because that’s where real change begins. When the federal government fails to take action, she said young people have had success pushing at local and state levels to ensure their elected officials are listening and stepping up. And that’s why, despite the horrifying legislation the Trump administration continues to put forward, Thu-Rhodes said she remains hopeful about the future. "In the midst of all the bad news that’s happening, we’re still seeing people across the country mobilizing, organizing their peers, and challenging and holding their elected officials accountable," Thu-Rhodes said. "This administration is doing everything they can to dismantle people's rights to live healthy lives. They've put up barriers and roadblocks, but that’s never going to stop young people from working towards bodily autonomy. Those are the rights that young people need and those are the rights that young people will continue to fight for." The U.S. Department of Health and Human Services has still not released the full proposal. Upon its release, you can submit your public comments to the HHS through the Federal Register. But as of today, two things are for certain: The Trump administration will continue to attack our reproductive rights, and young people will continue to raise their voices and fight this cruel, discriminatory legislation. Read our helpful guide on becoming more involved with pro-choice activism here.